Felicia Leatherwood, celebrity stylist and natural hair expert coming to Lagos! So we know it's been ages, but we've been working on something huge, and here it is! 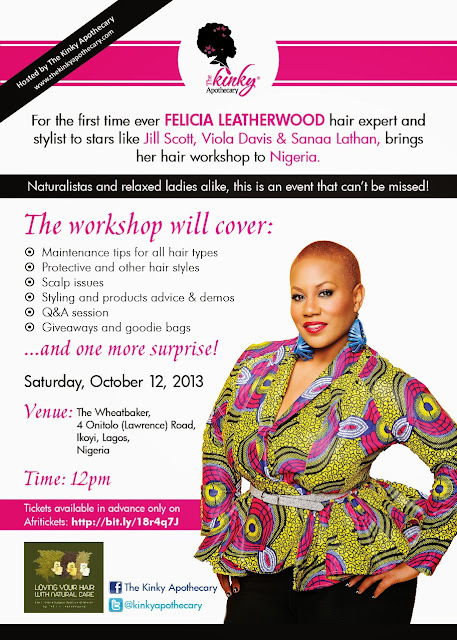 Remember this report on celebrity stylist (to stars such as Jill Scott, Teyonah Parris, Tomiko Fraser, Sanaa Lathan, Viola Davis...I could go on) Felicia Leatherwood's London workshop?! Well guess what... she's bringing it to Lagos!!!! When: On October 12th, 2013. Tickets available now on Afritickets. Just click on this link to purchase. You do NOT want to miss this one. Can't wait to see you there, we are SO excited! wow, this is so cool! congrats. Thanks so much, we are uber excited! :( Don't you just hate not being in Lagos.. Wish i could attend. Also I want to ask, do you have Cantu shea butter leave in among the products one could order? Unfortunately we don't stock Cantu products at this time. I hope I can attend to an event like this in the future! Keep it up Leticia!